More B2B marketers are shifting budget and priority to earned media as they struggle with declining response rates from traditional investments in paid media. According to a new survey conducted by Demand Gen Report, nearly half of B2B marketers have increased their earned media spend over the past year. 29% said they are now fully integrating earned media as part of their demand gen strategy. 32% said they are continuing to expand their use of earned media tactics to support demand gen goals. 17% are considering expanding their use of earned media channels for demand gen in the next 12-24 months. 15% said their use of earned media for demand gen has remained the same. 7% said they don’t use earned media for demand gen initiatives. The survey also showed that the increase in earned media efforts has proven effective for most B2B organizations, with 90% ranking their programs as somewhat (61%) or very (29%) effective at achieving their goals. Measuring financial impact of programs/ROI. Almost three-quarters (70%) of survey respondents said they would leverage earned media even more if they could track ROI effectively. The struggle to identify influencers to help support earned media programs. While paid media has traditionally represented the biggest slice of budget and attention for B2Bmarketers, the study found that this is quickly shifting with earned media on the rise. According to Demand Gen Report’s survey, B2Bmarketers currently spend approximately the same amount for earned media (24%) as they do for paid media (25%), while owned media accounts for 32%. 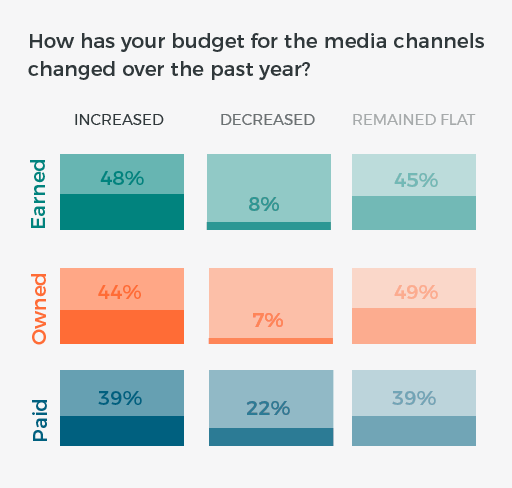 Nearly half (48%) have seen their earned media spend increase over the last year, compared to only 39% who said their paid media budget had increased. Declines in performance of paid media (41%). Another key driver of marketers turning more attention to earned media is the fact that B2B buyers are relying more on peers and industry thought leaders to shape decisions. Driving brand awareness is still the top goal (89%) for earned media investments, but the survey also showed more marketers are integrating earned channels into their performance marketing and demand gen goals. Increasing retention and customer satisfaction (38%). The way marketers are tracking the success/return of earned media is also expanding. While indicators such as page views and shares are often referred to as “vanity metrics,” they are clearly still key providing payoffs in brand awareness for marketers, as web traffic (75%) and likes/shares (61%) were still the top metrics being tracked to gauge the ROI of earned media. Therefore, in many instances, earned media is more like an opt-in message than an advertisement pushed toward a buyer, as buyers are searching for information from third parties. 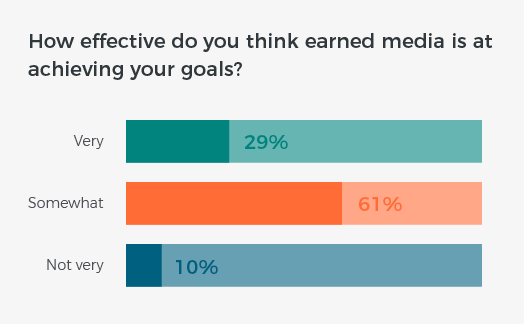 While the survey showed that B2B marketers are starting to tie earned media investment against performance goals, it also revealed that marketers are still struggling with measurement. The study found that while many B2B organizations would like to shift even more of their budgets to earned media, they are holding back on doing so because of a lack of confidence in proving the ROI of earned investments. When asked what their biggest challenges are in implementing an earned media strategy, 52% of respondents cited measuring financial impact of programs/proving ROI. Integrating with other technologies (39%). 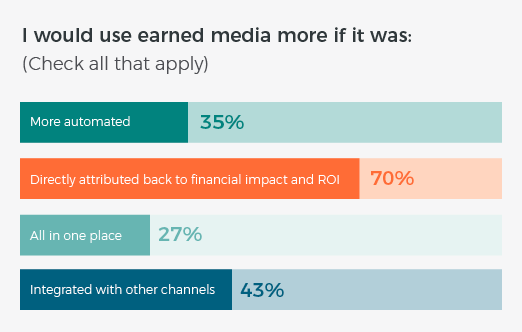 In addition, 70% of respondents indicated they would use earned media more if the channel was directly attributed back to financial impact and ROI. Another 43% said they would increase investment in earned media if it was integrated with other channels and 35% said they would expand their use if it was more automated. While she admitted it may require new tools and expertise, industry experts like Lieb stressed that relying on old metrics will not provide the accurate ROI picture marketers need to gauge the true impact of their earned media spend. “Stopping at page views or likes is sticking with publisher metrics, which don’t make sense for businesses,” Lieb said. Instead of focusing on interactions like web traffic or social media shares and likes, she recommends comparing what the paid media buy would have been for the same reach. Lieb shared an example where she worked with a B2B client who hired 22 influencers to create more than 100 pieces of content and promote the content through various networks. The company could have stopped with the millions of interactions with the content as a metric of success. Instead, the company went further and analyzed the investment based on how much it cost to engage the influencers and achieve the reach, comparing it to paid media. “Measuring business impact and budget, increased leads and conversion actions provides a better picture of effectiveness,” she said. Generating case studies/success stories (52%). Since content is a key part of any earned media strategy, the survey also gauged which content was most effective in supporting goals. While traditional approaches, such as news releases (50%), social posts (41%), blogs (32%) and speaking engagements (30%), topped the content menu, other emerging formats such as videos (25%) and influencer contributions (19%) were also high on the list. Although identifying and integrating industry influencers into earned media programs is clearly a growing priority, the survey revealed it is still a challenge for many B2B organizations. In fact, identifying and connecting with key influencers was cited as the top challenge (57%) to implementing an earned media strategy. Other responses that pointed to greater prioritization around influencers came in measuring earned media, with 26% citing influencer identification as an ROI challenge, and 29% of respondents prioritizing an influencer database as a key area of investment. The findings of this survey are significant because they show that earned media is not only the priority of PR teams but now represents a fully integrated strategy to build brand awareness, drive pipeline and increase revenue. While the survey showed there is clearly interest among marketers to rely even more heavily on earned media to support their performance goals, there is still hesitation to do so until they can directly attribute those investments back to ROI. Therefore, continued advancements in measurement will be critical for this category in the future. The challenges around measurement are not uncommon in any growing and evolving media channel, with lack of resources and knowledge understandably ranking as top hurdles. However, the fact that marketers are also looking to better track activity across channels shows that earned media will need to be integrated into broader programs, not only in strategy and execution but also in measurement and analysis. Assuming the toolset and expertise continue to expand in earned media in the coming years, it is fair to expect investments in this channel to continue to climb, especially as messaging-rich formats such as native advertising and sponsored content continue to grow. The Shifting Strategies For Earned Media survey was conducted by Demand Gen Report between January and May 2017. The survey findings were based on 169 respondents, which represented a variety of roles and industries across B2B marketing in North America. Among the respondents, roles included 19% C-level, 12% VP level, 32% Directors, 27% managers and 10% other titles. The role of the participants included marketing communications, content marketing, digital marketing and public relations. The top industries represented included technology 25%, financial services 8%, manufacturing 7%, professional services and healthcare (6%). Demand Gen Report (DGR), a division of G3 Communications, is a targeted online publication that spotlights the strategies and solutions that help B2B companies better align sales, marketing and disparate teams to support growth and drive revenue. DGR content and news coverage focuses on the sales and marketing tools and technologies that enable companies to better measure and manage multichannel demand generation efforts. Demand Gen Report is the only information source directly focused on this rapidly emerging business discipline. Cision Ltd. (NYSE: CISN) is a leading global provider of earned media software and services to public relations and marketing communications professionals. Cision’s software allows users to identify and engage with key influencers, craft and distribute meaningful stories, and measure the financial impact. Cision has over 3,000 employees with offices in 15 countries throughout the Americas, EMEA, and APAC. Learn how to communicate like never before with the Cision Communications Cloud®.